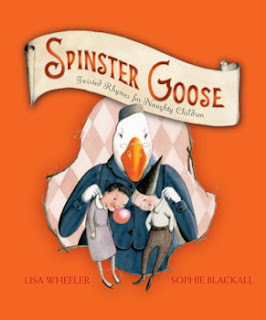 by Lisa Wheeler, illustrated by Sophie Blackall. Atheneum Books for Young Readers, 2011. So here is what you get when you cross the sickly funny humor of Shel Silverstein with traditional nursery rhymes, and throw in the lovely illustration style of Sophie Blackall (Ivy & Bean). This is a funny little picture book. There isn't much more I can say about it. Funny, funny, funny. Hilarious! I need to get my hands on this book! Oh, yes. This one would be right up your alley. Seriously. It's very funny. These are hysterical! Wacky and funny are always welcome on our bookshelves and these look to be a Must Get. We loved it. It's a giggle.